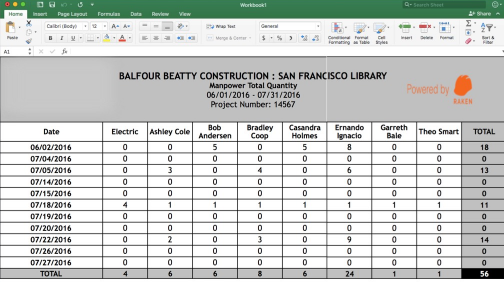 Construction contractors have a thousand items to track and reports to create on a daily basis. Manpower reports are especially frustrating and time-consuming because they require a large amount of manual data entry from disparate data sources. Modern manpower reporting software like Raken automatically create detailed manpower reports from the daily report data that you’re already collecting on your construction sites. 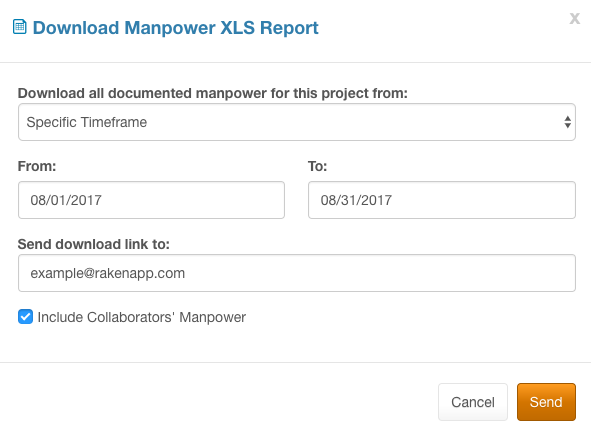 Manpower reports are the easiest way to visualize your construction work logs on a single document. A strong manpower report format give you insights into the number of hours worked, the number of workers across different sites, and the description of work performed on those sites. Manpower reports can vary depending on the data you are collecting and the software you are using to collect it. Raken’s manpower reports, detailed below, are built for efficiency and ease of use, automatically formatting the data so that it’s easy to read and accessible. If you’re already using Raken, you’re familiar with the enormous amount of data you can collect from a construction site in a single day. Work logs, surveys, photos, weather reports, the list goes on and on. The Raken manpower reporting software allows you to export all your work log data into Excel, giving you insights over hours worked, manpower across multiple jobsites, as well as actual descriptions of work performed. The best part? It doesn’t require a change to your daily reporting workflow or any additional information to be collected in order to be created. Creating a daily construction manpower report using Raken is quick and easy. Simply navigate to your Raken dashboard on a desktop, click on the arrow next to “Report” on the top right of the page, click “Manpower” and select the desired time frame. Note: Raken Manpower reports are only available to performance users. 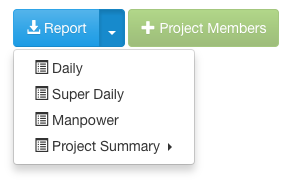 If you’re using the Super Daily, you’ll have the option to include your collaborator’s manpower as well. Finally, hit “Send” to request this report. Once you receive it via email, simply download the report to open it up in Excel. This video walks you through creating a manpower report on the Raken dashboard. What’s in a Raken Manpower Report? The first two tabs on the bottom left of your spreadsheet cover the number of workers and hours worked for each contractor or employee on the job. This helps you keep track of manpower during the specified time frame and helps you make sure that you’re staying on schedule with each of your trades or employees. The next tab, Detailed Manpower, is specific to your project and breaks down all of your work logs by each day and by each specific entry. This is a great way for you to locate or search for any work performed. You can see your company name, the date, the employee or contractor, the number of workers, hours and total hours. Each day is summarized with its totals. On the bottom of the spreadsheet, you will see the grand totals. A lot of our clients use this detailed manpower report for payroll purposes, running this on a weekly or bi-weekly basis. The next tab, Detailed Manpower - All Projects, displays the same information but includes all the projects that you’re a member of. The final tab displays work log hours by project. This is a great way to keep track of contractors or employees who work across multiple projects. Interested in trying Raken for your manpower reporting? Try our new construction time cards!